I am no longer offering any parts, but all design files needed to build your own are here. Note: Xilinx phased out the 5V CPLD that I used for this design in 2012. The 3V part WILL NOT work. Some ebay sellers are still offering the 5V part. 10 or 15 nSec versions should be fine.. Designed to assist in debugging/repairing Z80-based computers, like those made in the 1970's or early 1980's. Inspired by Nicolet Paratronics' "NICE" Z80 In-Circuit Emulator, but with improved performance and additional features. Tested so far in systems operating at 4 and 5 MHz. (Limited testing at 6 and 8 MHz) Briefly tested at 9 MHz. Above 8 MHz you are on your own. 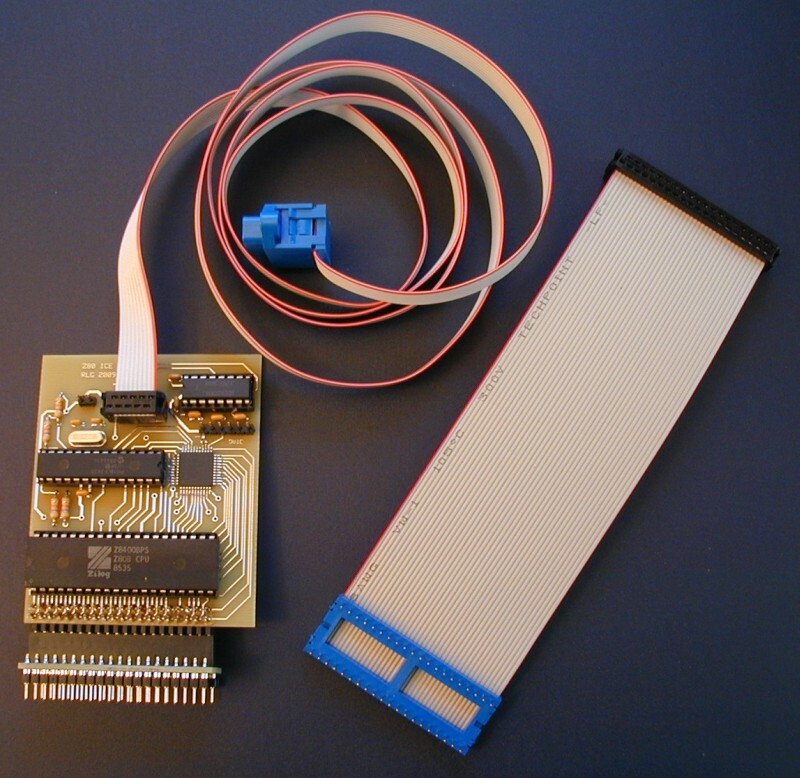 Above photo shows a populated Z80 ICE board with ribbon serial cable and 40-pin DIP plug attached. Using the DIP plug/socket provides the best connection to the target system, but may not always be possible. In those cases, the short ribbon cable (also shown) can be used. The four chips are: 6 MHz Z80B, PIC18LF2420, Xilinx XC9536 CPLD, and HIN232. PC board supports connector for ribbon serial cable or 6-pin header for USB-to-serial adapter. Here are the assembly instructions, schematic page 1 and page 2, parts list, parts placement, and operating instructions. Note: Soldering the Xilinx CPLD used in this design requires a fine-tipped soldering iron and a steady hand. Please don't attempt it unless you have experience working with fine-pitch SMT parts. I won't be able to help you if your board doesn't work. Note: To program the CPLD after it is installed, you will need access to some sort of Xilinx JTAG programmer. The one I use is an older design called "Parallel Cable III/DLC5". It connects to a PC's parallel port. 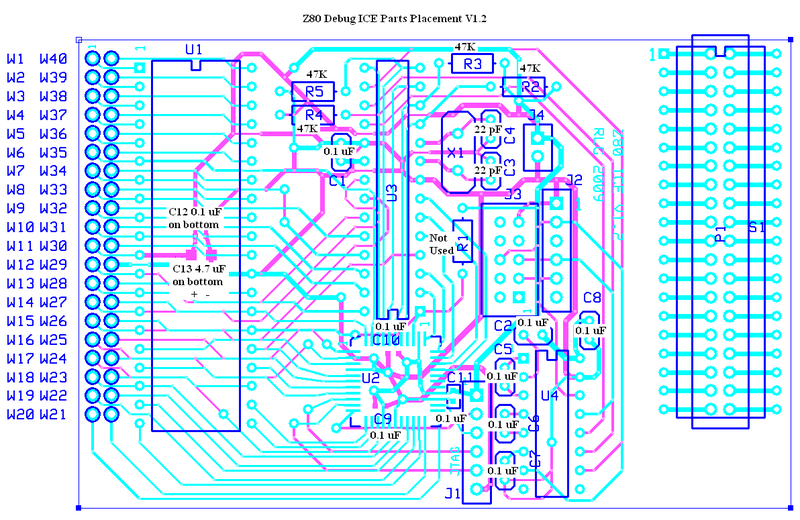 (Here is a schematic, downloaded a long time ago from the Xilinx web site, which I think is for the JTAG programmer I have.) Clones of this may be available on a popular internet auction site. Also, although I haven't tested it, this site is selling a programmer that appears to use the same circuit as the Xilinx one that I use. Newer Xilinx JTAG programmers use USB and should work as well. 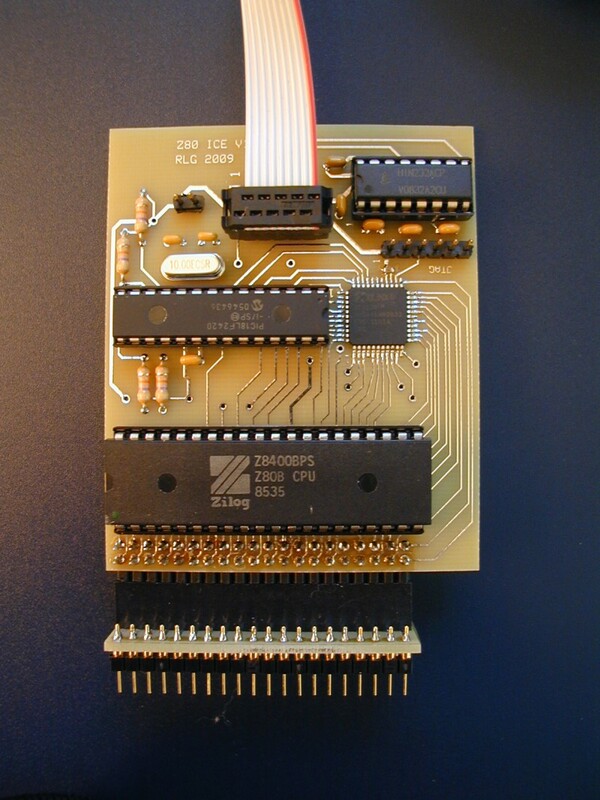 Note: You will need to program the PIC chip with some sort of programmer that can handle the PIC18LF2420. These programmers are available on a popular internet auction site. You will need a programmer that has a socket for the chip, not an in-circuit type, since my board does not have a header for in-circuit programming. I may offer programmed PIC chips if there is demand. Note: I recently (6/2011) found several small issues involving V0.64 and older code: The disassembly of conditional call opcodes was incorrect. The number of instructions disassembled with the list command was sometimes less than requested. I also discovered that breakpoints were not working when using the trace command. (Untrace was OK) Several new versions of the code with these bugs fixed have been added to the .zip archive linked from this page. Nothing else was changed. Here is a .zip archive which contains a .hex file containing the PIC code (my latest version, V0.72), an ExpressPCB .pcb file, and top.jed, which is a JEDEC file for programming the Xilinx CPLD using a JTAG programmer. The .pcb file is the correct size for the "miniboard" service, and contains the main board plus the 40-pin DIP plug. Cut the DIP plug PC board off before populating the main board. Note: The pins on the DIP plug/socket are round machined pins, which may not fit into all IC sockets. Of course you could always plug the round pins into a standard IC socket which has flat pins. Note: The design information offered here is not guaranteed to be useful for any purpose. Please download and use it at your own risk. I will not be able to help you get your ICE working if you have trouble. Note about cabling: Someone recently built the ICE but put a male header on the DIP plug instead of the female, then was planning to use a female to female ribbon cable to connect this DIP plug to the ICE. This won't work, as it swaps the pins relative to what the standard female socket would do. Pin 1 of the ICE's Z80 ends up connected to pin 40 on the target system, pin 2 to pin 39, etc. Please stick with the DIP plug attached to the ribbon cable that Digi-Key sells and mount a std IDC female on it, as shown in the photo on this page. That will connect pin 1 to pin 1, 2 to 2, etc. DISCLAIMER: I take no responsibility whatsoever for the use and/or implementation thereof, or the misuse leading to damage to equipment, property, or life, caused by the above circuits.